Beautiful clear hikes characterizes December hikes, but a jacket may be necessary. December often brings moderate snow to Boulder Mountain and light snow to the Desert. Nighttime temperatures are below freezing and daytime temperatures a often comfortably above freezing. The snow line is creeping down through the Transition Zone dropping down to the higher elevations of the Upper Sonoran Zone. Upper Sonoran Zone – Hiking in the desert and on slickrock is splendid on clear days where snow is not too deep. Riparian Zone – Hiking the riparian zones with water crossings is challenging due to the near freezing water temperatures. Transition Zone – May require snowshoes. Canadian Zone – Snow shoes may be necessary. Hudsonian Zone – Snow shoes are necessary. 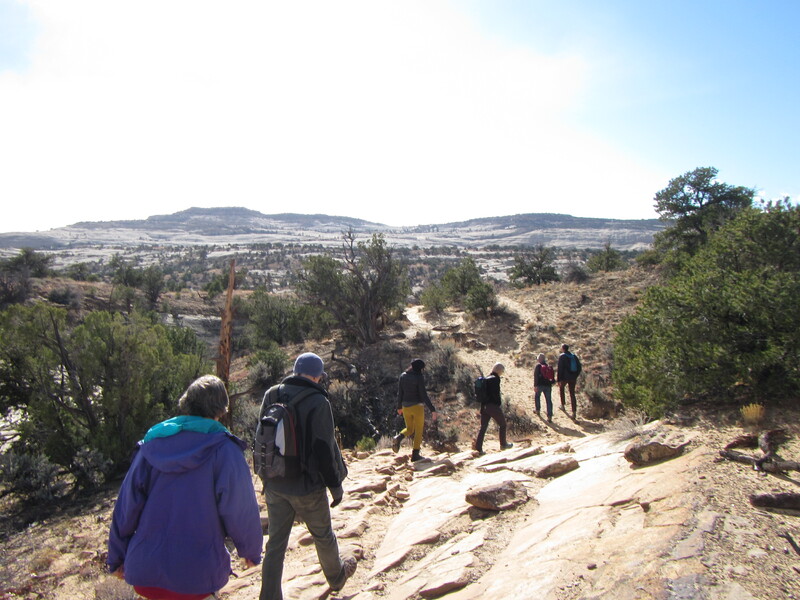 Recommended hiking — Slickrock Hikes, Rim to River Hikes without water crossings and Boulder Mountain Hikes within the Transition Zone. Snow shoeing may be an option in years with heavy snowfall. 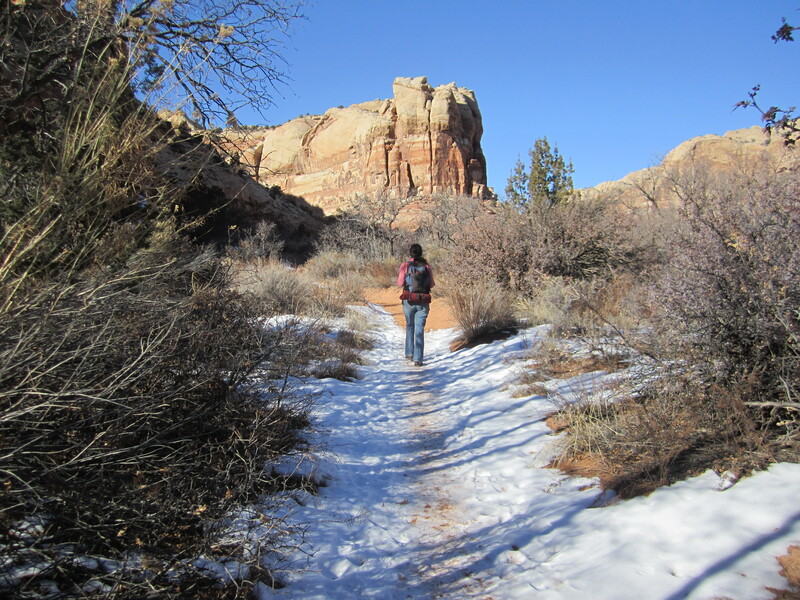 One of the gorgeous warm clear days in January beckons us to the canyons for pristine hiking conditions. January is typically our coldest month. Heavier snows typically fall in this month. The snow line is well into the Upper Sonoran Zone. In heavy snow years the entirety of this zone will be snow covered. We might have 7 to 10 days in the month when nighttime temperatures are in the single digits or even below zero. The daytime temperatures on these days seldom rise above freezing. The rest of the month often sees low temperatures of in the 20’s and daytime temperatures in the 40’s . For these warmer days, if the sky is clear and sunny then hiking is excellent in the desert as is snowshoeing on the mountain. The colder days are best spent indoors with a nice warm mug of your favorite beverage and a good book. Upper Sonoran Zone – Hiking in the desert and on slick rock is splendid on clear days where the snow is not too deep. Canadian Zone – Snow shoes are typically necessary. Recommended hiking — Slickrock Hikes, Rim to River Hikes without water crossings and snowshoeing on the Boulder Mountain Hikes. 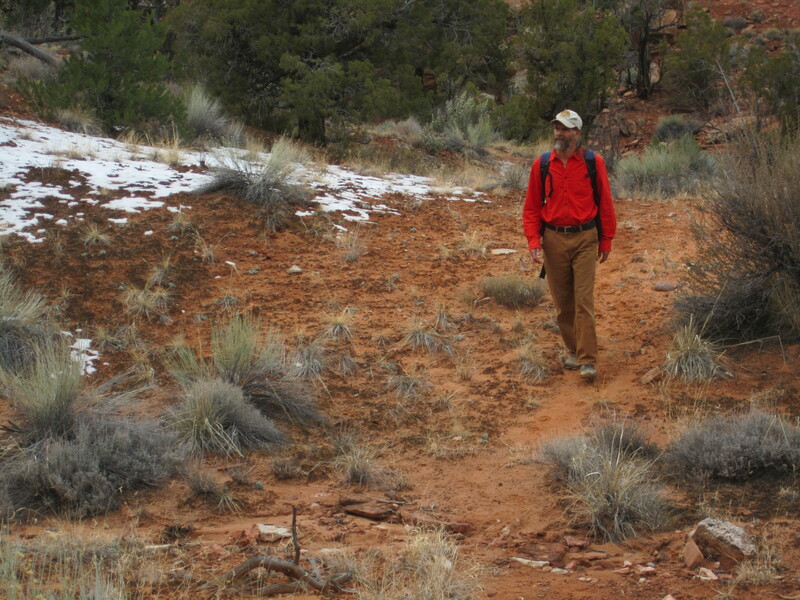 February provides mild temperatures for hiking the canyons. Small patches of snow may be found on northern aspects. February starts the warming trend. Daytime temperatures are often quite comfortable with an occasional cold temperature day. The snow line is going up in elevation. In years of average snow, the snow melt begins in February and the Higher elevation roads may be muddy. The snow is patchy in the Upper Sonoran Zone and the snow line frequently is back in the Transition Zone. The desert provides amazing hiking and snowshoeing is still an option on the mountain. Upper Sonoran Zone – Hiking in the desert is splendid on clear days where the snow is not to deep. Transition Zone – May still require snowshoes. Possibly in snow melt. Canadian Zone – Snow shoes may still be necessary. Let’s Hike, Explore and Discover!